Usui Reiki is a Japanese technique to reduce stress, relaxation and a form of hands on energetic healing. It was initially developed by Japanese Buddhist Mikao Usui and has subsequently been adapted by various teachers with a range of traditions. Through the use of “laying on hands” or hands on healing, practitioners transfer universal (Qi) energy through themselves and out their palms into their patients or themselves for self-healing. The word Reiki is made up of two Japanese words – Rei which means ‘Spirit’ or ‘Divine’ and Ki which means ‘energy’ or ‘life force’ and is also the symbol for Qi within Traditional Chinese Medicine. 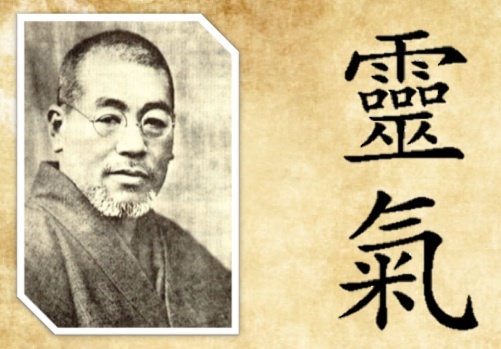 Usui Reiki is a traditional Japanese style of Reiki that follows the teachings of Mikao Usui. It involves the use of specific symbols that are used to enhance and activate the practitioner’s palms to enable the hands on healing and transfer those symbols to the patient. 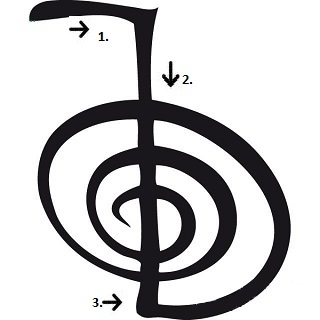 The Cho-Ku-Rei symbol from Traditional Usui Reiki. Tibetan Reiki is a system derived from Usui Reiki and uses a range of additional different symbols in the hands on healing process. Seichim is a system of Egyptian energetic hands on healing developed by Patrick Zeigler in 1980. It focuses the Egyptian lion Goddess Sekhmet who is has been attributed as patron goddess for healing in ancient Egypt. The first level starts an individual on the Reiki path as a practitioner, opens up the universal energetic channel and activates their hands in preparation for healing. The second level expands the energy channels, focuses on healing and more specifically distant healing. At the second level students receive the Reiki symbols. The third level of Reiki is teacher or Master, it is at this level that you learn how to pass on the Reiki traditional hands on healing system. People experiencing Reiki healing often feel extreme warmth radiating from the palms of the practitioner and a sense of calm coming over their bodies and mind. An increased sensitivity within the hands of a Reiki practitioner can help with numerous aspects of energetic healing. Simon Altman has completed all three levels of Usui, Tibetan and Seichim Reiki styles, making him a master within all three disciplines.